Two California twins have invented a candle that emits hydrogen blue sparks caused by HydroBlaze, a water-based hydrogen fuel that gives combustion a boost of hydrogen energy. They have just released a video of the world’s first quantum candle to reveal its secrets. When burned, the candle invented by Peter and Paul Park emits a flurry of cyan-blue sparks thought to be hydrogen energy. These light blue sparks come from the HydroBlaze, an organic water-based hydrogen fuel invented by the two brothers. The wick is coated with the fuel and then dipped into normal wax. 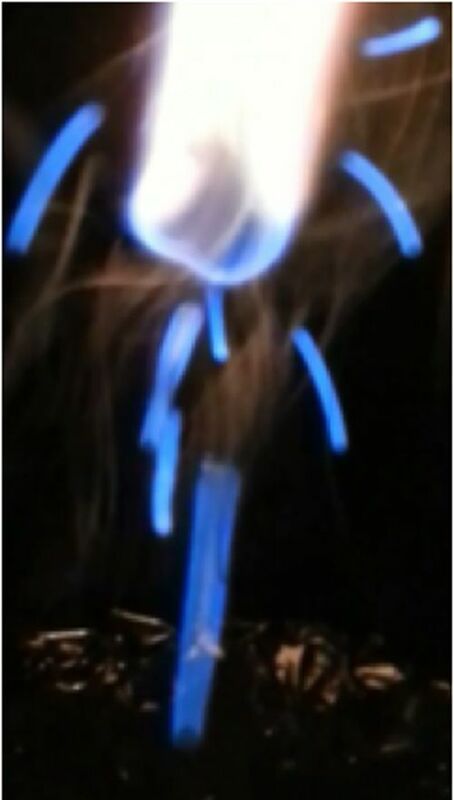 When lit, the hydrogen containing fuel combusts forming cyan-blue sparks of hydrogen energy. The color of the sparks is a fingerprint of hydrogen combustion, which commonly displays three different colors, namely red, blue-green or cyan and violet. The video reveals a clear match with Hydrogen's cyan illumination. “This is what gives our candle a quantum twist,” said Peter. “We have hydrogen energy radiating from an ordinary candle." The brothers allege their HydroBlaze to be a sustainable fuel capable of safely storing and releasing hydrogen energy into any form of combustion. It can be ground into a fine powder and then dissolved into a soluble solution such as gasoline or wax as a power-enhancing additive. “HydroBlaze is very similar to spice," explained Paul. "Spice makes every recipe tastier and more exciting. HydroBlaze does the same for combustion systems. When you add HydroBlaze to a combustion system such as a candle, you have an abundant source of hydrogen at your disposal that can be used to provide a boost of energy. This increases the overall energy output and efficiency of that system." It has been said that necessity is the mother of invention. The Park brothers began their experiments during the summer of 2005 in San Francisco. At one point in their early research, they had to use candles for light, finding themselves with no electricity. The twins eventually used those very candles for their first tests of the HydroBlaze fuel. This provided the spark culminating in the inception of Blazing7th Energy, a hydrogen-focused energy company at the leading edge of research into the production, storage and delivery of water-based hydrogen energy. It is also said if something seems to be too good to be true, chances are it’s not, but we’d like to think the twins are onto something. As far as we know they have not learned how to fold space, and their invention has nothing to do with House Atreides. Interesting. Would like to know how they're keeping the hydrogen chemically stable so it doesn't react with anything in the atmosphere or the water they're mixing it with, but that's probably the crux of their research, so I doubt they're going to just offer up an answer to that question. Yes it's interesting, but as I mentioned seems too good to be true. Worth watching to see if something develops or if it just fades away. Just off the top of my head, I believe it's either baking soda or bauxite that companies are using to harness Hydrogen in solid state anyhow. The two substances might be the same thing, but my chemistry isn't fresh in my mind. It still doesn't solve the problem of needing 3x the energy inputs to receive 1x the Hydrogen stored energy in fuel form. Just for clarification, I am one of the inventors of HydroBlaze, and I would like to clarify that there is absolutely no baking soda or bauxite in the fuel. How they soak hydrogen in to the wick? If they can do this then we have easy fuel storage for cars. Halloo?